Prime Minister Justin Trudeau is the third Canadian leader since the flagship billion dollar RADARSAT Constellation Mission (RCM) was approved in 2004. This past week on a visit to Montreal, he stopped by MDA’s facility to see the satellites and take a tour of where some of Canada’s innovation in space products takes place. The visit was not an opportunity to make a funding announcement. If that had been the case, then the minister in charge of the space portfolio, ISED Minister Naveep Bains, would have been there. 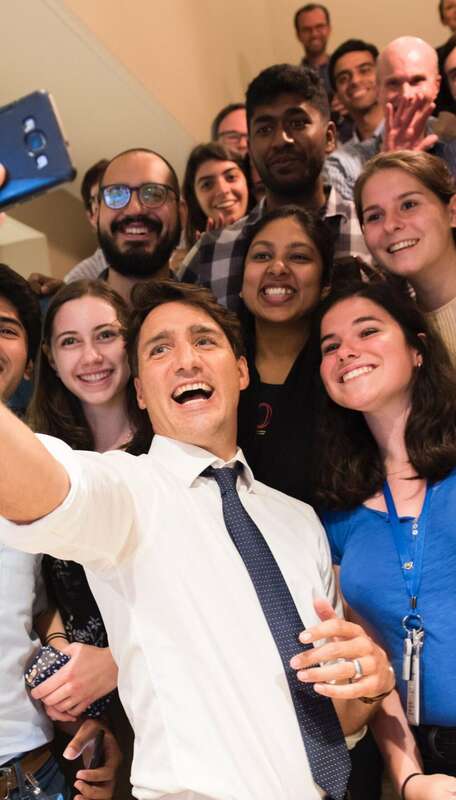 The Prime Minister Trudeau takes times at MDA for some selfies. Credit: MDA. No, this was an opportunity to see where some of the billion dollars of tax money for RCM had been spent over the course of the 14 year project before the satellites are wrapped up and shipped to California for their November launch. That launch will be provided by SpaceX using a Falcon 9 rocket with all three satellites onboard and will liftoff from Space Launch Complex 4E at Vandenberg Air Force Base. It was also an opportunity for MDA’s Group President, and tour host, Mike Greenley, to showcase and explain what MDA does and why it’s important to the economy to one the person who can ultimately sway a decision for funding a major project in Cabinet. And therein lies part another part of the message delivered by MDA, jobs, the RCM program is a major government program that created good jobs, not just at MDA, but other companies like Magellan in Winnipeg. As summer winds down and thoughts of fall already looming, the political summer siesta, such as it is, will be over and members of parliament will be back in Ottawa. Will the fall see movement on the space file? Will a successful launch of RCM be an occasion to announce a renewed commitment to space? Will funding follow for another major project or a series of smaller projects? Stay tuned.